Combinatorial auctions allow bidders to bid on individual items or bundles of items. This enables bidders to take advantage of the synergy or complementarity in their valuations of bundles. However, the number of bundles or packages that a bidder could explore may be large making these auctions too complex. Therefore, a combinatorial auction is often run as an iterative auction involving a series of rounds that progressively lead to a final allocation. In each intermediate round, bids are submitted and then provisional winners are determined. A key element in each round is the provision of price feedback to guide bidders in subsequent rounds. This price feedback can focus on packages or on items. Item (also known as linear) pricing feedback schemes have been widely researched for combinatorial auctions on unique items (where packages consist of one or more unique items but not multiple amounts of any item). It has been observed that such item price schemes have performed reasonably well in a wide variety of auction markets. However, they have not yet been thoroughly tested for auctions where the allocation involves multiple units of different items. 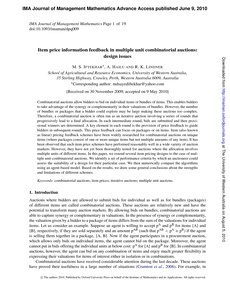 In this paper, we extend several item pricing designs to the case of multiple unit combinatorial auctions. We identify a set of performance criteria by which an auctioneer could assess the suitability of a design for their particular case. We then numerically compare the algorithms using an agent-based model. Based on the results, we draw some general conclusions about the strengths and limitations of different schemes.